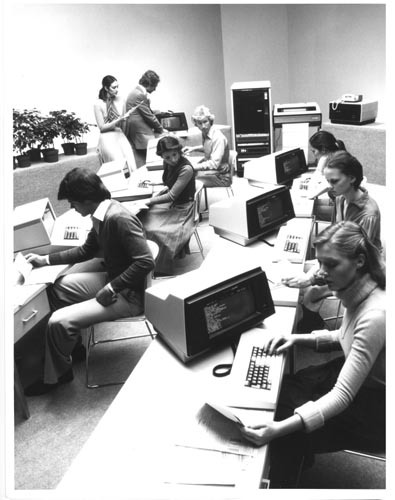 B&W image of an data capture environment.Men and women are seated at terminals with keyboards. They have documents and are entering data into the system. In the background is the system with a man and woman standing. Verso attached metadata: " The SPERRY UNIVAC 1900/10 Distributed Data Capture shared processor can be used for distributed processing, the capture and validation of data, local processing, transmission of data to a central site, reception of central site reports and the handling of other data for local use. The contral COntrol Unit is a bipolar microprocessor with a 200 nanosecond instruction time,. Up to 32 keystations places up to 3000 feet from the CPU can be used with the 1900/10 system. From: Michael M. Maynard Sperry Univac P.O. Box 500 Blue Bell, Pa 19424 Tel: 215/542-4213"